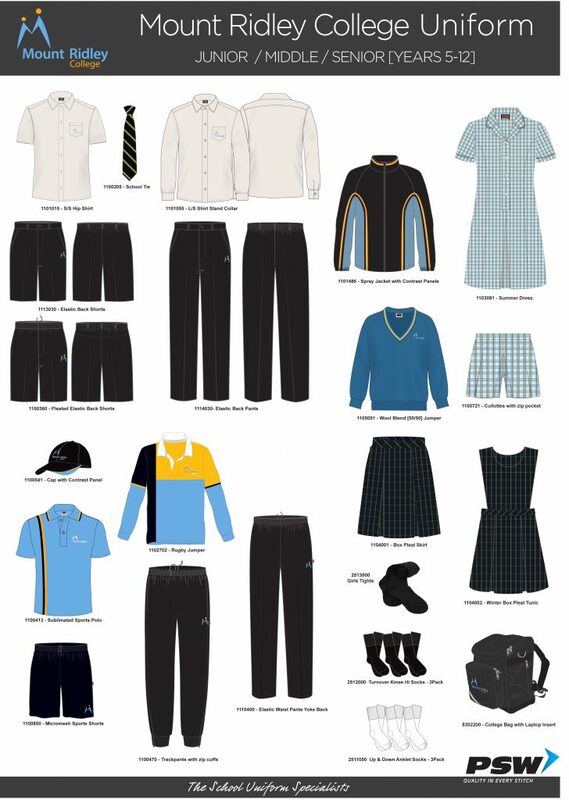 Uniform items need to be purchased from our approved uniform supplier, PSW. The PSW store is open Monday to Friday 9am to 5pm and Saturdays from 9am to 2pm throughout November to February. It is open Tuesday to Friday 9am to 5pm and Saturdays from 10am to 1pm from March to November. The store is located at 2/283 Rex Road, CAMPBELLFIELD. Setting, maintaining and enhancing the positive image of the College in the community. Consultation through the use of a number of parent focus groups has resulted in the development of a practical and distinctive College uniform. The colours chosen for the College are Sky Blue, Gold, Natural and Black. Inspiration has come from the iconic landmark of Mount Ridley and the volcanic rock which now lies dormant beneath it, represented by Black in the colour palette. The Gold and Sky Blue represent the sun and sky – a new dawn symbolizing the birth of a new school community. The natural represents the earth and the land on which the College is built. 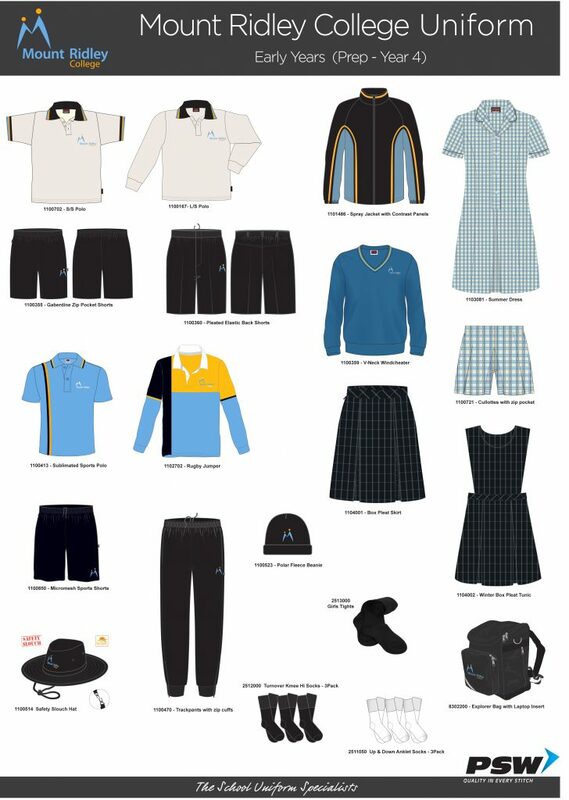 Mount Ridley College has a uniform dress code for all students which consists of a standardised range of clothing, including footwear and headwear. It is in place to clearly identify students of the College. Students are required to wear the uniform during school hours, while travelling to and from school and when engaged in school activities out of school hours. Sanctions are implemented when a student attends school out of uniform without a valid reason. The College does accommodate the differing religious beliefs of our students in relation to clothing. Written application must be made to the Principal in these instances.